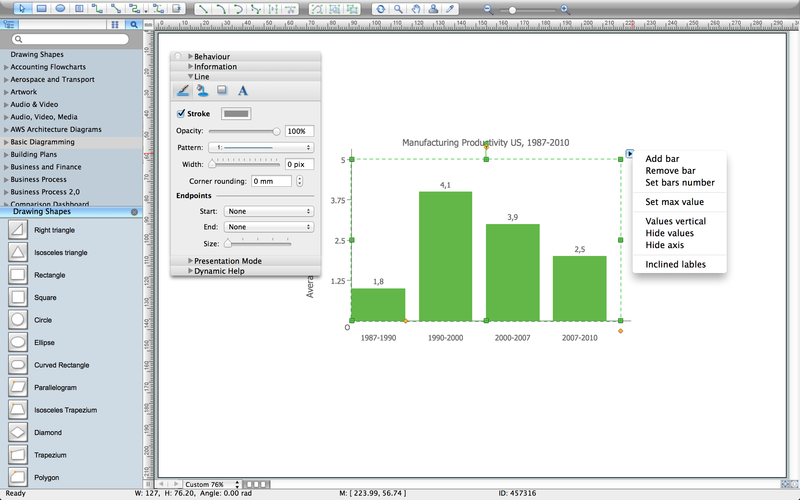 Create bar charts for visualizing problem solving in manufacturing and economics using the ConceptDraw DIAGRAM diagramming and vector drawing software extended with the Bar Graphs Solution from the Graphs and Charts area of ConceptDraw Solition Park. Example 2. 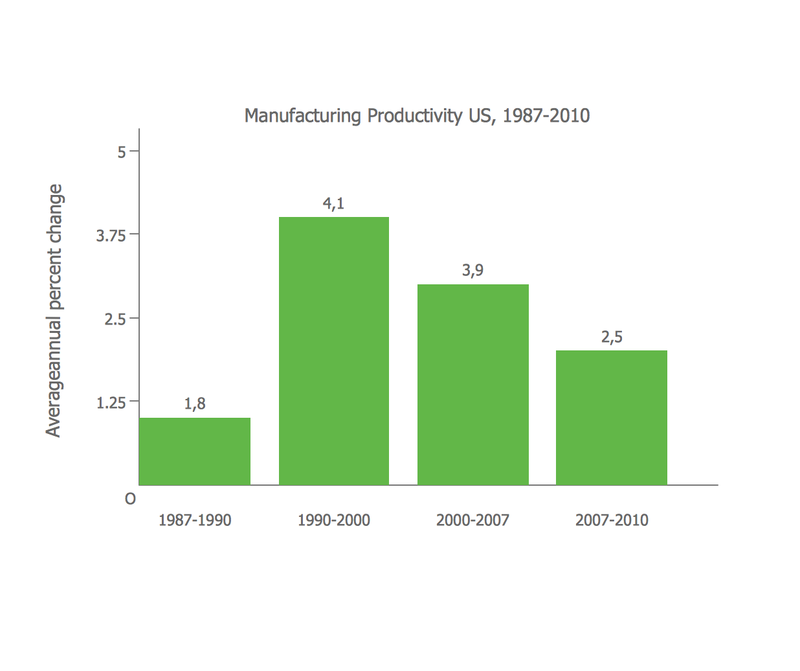 Vertical bar chart example - Change in Productivity within the Manufacturing Sector of industry in the United States, 1987 - 2010. To what extent could declining Manufacturing Productivity suggest a trend of deindustrialisation? Increasing national productivity can raise living standards because more real income improves people's ability to purchase goods and services, enjoy leisure, improve housing and education and contribute to social and environmental programs. Productivity growth also helps businesses to be more profitable." This bar chart was redesigned using the ConceptDraw DIAGRAM from the Wikimedia Commons file: BLS --- Graph --- Manufacturing Productivity, 1987 - 2010.gif. This sample was created in ConceptDraw DIAGRAM v12 diagramming and vector drawing software using the Flowcharts solution from the What is a Diagram area of ConceptDraw Solution Park. This sample shows the Flowchart of the Subprime Mortgage Crisis. This Flowchart describes the decline in housing prices when the housing bubble burst and what it caused on the housing and financial markets. You can also see the Government and Industry responses in this crisis situation.